Egypt's election committee on Monday lowered its turnout figure for the first stage of parliamentary elections, blaming a counting mistake that skewed numbers published last week. "The accurate percentage of attendance in the first round was 52 percent, not 62 percent," Abdel Moez Ibrahim, head of the election body, told reporters. He said members of the committee's secretariat made the error, adding that he "was very tired" when he gave initial figures at a news conference last week. Egyptians voted last week in the first election since a popular uprising toppled President Hosni Mubarak in February. Several courts have ruled that counting problems in various constituencies in Cairo and the southern city of Assiut mean voting there was invalid. 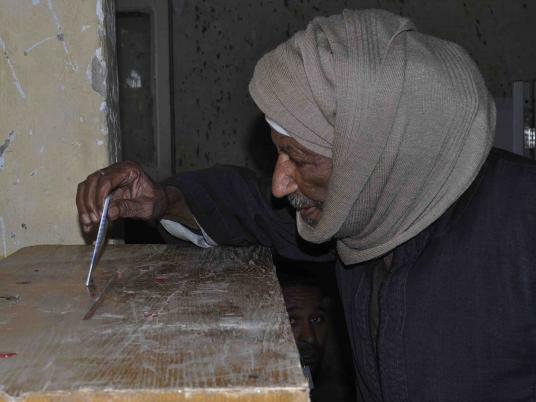 In one Cairo constituency, 75 ballot boxes were damaged and 15 went missing during the counting process after supervising judges left their posts in protest at poor conditions in the polling station. The election committee has said the 90 boxes in question were excluded from the final count. Some candidates have complained that this has hurt their chances of winning. Ibrahim said on Monday that although run-off votes were continuing in constituencies where court rulings had deemed the earlier results invalid, no results would be announced for these until the supreme administrative court issues a final decision. "We will stop the announcement of the results … until the court gives its final ruling," he said adding that elections would be repeated in any constituency where the court invalidated earlier results. Ibrahim also said he had asked the ruling military council for the ballots to be counted in the polling station where they were cast to avoid problems in transporting ballot boxes and to maintain judicial supervision throughout. On campaigning violations, Ibrahim said he had informed all concerned parties but that it was not within the mandate of the election committee to enforce penalties. "My message … is to the Egyptian voters, how can you elect someone who is supposed to be drafting laws while he is the first one to violate laws?" Ibrahim said. "It is a moral offense before being a criminal one."